Ghosts of Olar « "TeresaBruceBooks"
Leaving Olar at almost seventy miles an hour is not when you want to see a South Carolina state trooper. Especially not one headed back into town, wondering what’s your hurry. His lights flash all they want but still aren’t near as blue as the disappearing sky. There’s no excuse crazier than the truth. The ghosts of Olar are at our back, puffing their cheeks to blow us away. We try it anyway. The trooper can’t be but twenty-five at most, might not have heard it all yet. No sir, not sure how fast we were going. Too busy talking, for what it’s worth. First time in Olar. Still can’t quite believe how pretty it is. This Olar? he asks. Stiff hat brim shadows can’t hide his puffy skepticism. No-one stops in Olar voluntarily. He’s behind us now, cross checking our license plate against DUIs on his on-board, patrol car computer. When it comes back empty handed so does he. It’s a warning, he says, but we already know that. Just as sure as we know that we’ll come back anyway. There is nothing so irresistible as being unwanted. South Carolina plates and a bag of boiled peanuts in the front seat don’t qualify us as been here’s. We’re come here’s, strangers from points East. Doesn’t matter that we aren’t lost, trying to find the interstate or the bomb plant up the road a piece. We’re driving the back roads gussied up by tourism officials as the South Carolina National Heritage Corridor. But deliberately looking for Olar is tantamount to sneaking up on it. Not that any curious locals draw open a curtain or roll down a window as they drive past. With a population 212 and dropping, ten percent a decade, the whole town looks empty, drained. We are trespassing on yesterdays. Just how many isn’t immediately evident. We pull up to a squat, one-story red brick building with a pole sticking straight out of its bulky forehead. A wood, hand-lettered sign hangs from it, perpendicular to the street. It’s only the last breath of twilight that swings it, gently, nothing sinister. The lettering predates the ubiquitous, commercial Helvetica font of common towns and nomenclature. It is carefully ruler-traced, black on white, the Bank of Olar. As ghosts go, this one doesn’t seem friendly. The windows on either side of a plain wood door are hung from the inside with faded blue fabric so you can’t see what’s left. Injured pride, maybe, after all these bank bailouts and bonuses. Nobody bothered to save the Bank of Olar. The entrance wasn’t grand enough, a shoe-scuffed concrete stoop only one step up from the cracked sidewalk. Deals died here, along with dreams of keeping farms in the family. It wasn’t until the 1980s that South Carolina officially lost its rural status, and ceding ground is never graceful in the South. There’s a round glass electric company meter stuck to the side flank of the Bank of Olar, still monitoring for a heartbeat. The window sill is only deep enough to lean against, not to sit and kill time. For that, you walk across Low Country Road, what Highway 64 calls itself when it passes through the eight tenths of a square mile that make up Olar. Stained black timbers form an open-air, triangular shelter, heavy with shade. The Works Progress Administration designation is a “shed” but it looks more like an alien ski chalet without the walls. Maybe the idea for it came down from the North along the “Route of Courteous Service.” Olar was a whistle-stop on the Seaboard Air Line Railway from Richmond to Jacksonville back when Southern hospitality slogans lured tourists to Florida. Maybe that’s what gave the Heritage Corridor people the idea. We came, so you could say it’s working. If the general store were still alive, we’d gladly contribute to the local economy, buy a can of Cheerwine and a Moon Pie and watch the ghosts of trains go by. But behind the side-by-side screen doors of the Creech Variety Store, established 1938, is a closed sign, like the owner just went out for a cigarette. Back in ten minutes, fifty years ago. The window sills are painted a blue that might be borrowed from a little east of here, on the sea islands. 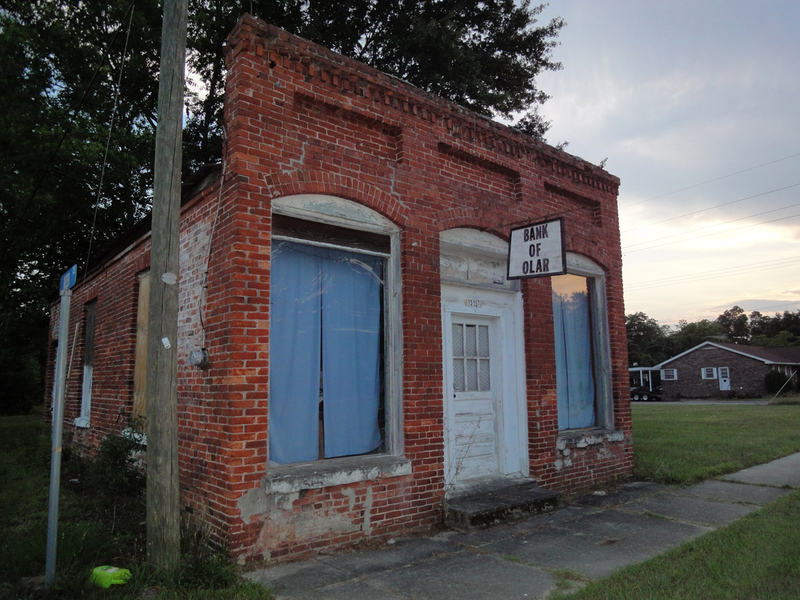 The Gullah people call it “haint blue” and swear it keeps bad spirits from barging in where haints aint wanted. What color keeps out conjuring, the kind outsiders do when they imagine what could be created here? Adaptations whisper from the arched facades, possibilities rustle through the leaves of Sycamores that shade the sidewalk. Good bones, these brick and mortar relics, capable of resurrections — cafés, dance studios or photography galleries. Screw a new bulb in the lamp clamped above the sign and Drink Coca Cola would light the way to Olar after darkness falls. Crickets begin to chirp, phantom frogs pick up the protest. Something slithers through the grass. Move along changers, the buildings mutter, we are settled in our ways. Gone but not forgotten. The store windows are clear enough to peer through, to long strips of wood flooring and walls still lined with shelves and cubbyholes. White painted tin squares pucker along the ceiling, high enough for heat to rise and gossip to carry. Who wore what to the horse races up in Aiken. Who got what for their cotton farms when the nuclear plant claimed everything from here to the Savannah River. No wonder the wariness of Olar, outsiders deserve a little suspicion. Across the tracks it’s just as melancholy. An abandoned gas station stands in the center of a grass lot, neatly mown except for the whiskers of weeds that tickle through gaps in the cement slab. Buicks and Oldsmobiles would have kept them down before, back when this building, out of all Olar’s ghosts, was a sign of progress. It’s stripped bare now, down to the metal knuckle that anchored down the pumps. Rust drizzles from the metal roof, leaving bloody stains on stucco walls. Exposed brick is unintentional. Move along, the walls whisper, nothing here to plunder. But inside even this most industrial of abandoned buildings there’s a sense of beauty waiting to be remembered. Nothing is destroyed, just left behind. The exhalations of customers no longer breathing rise and fall in an endless loop of captured space. A peaceful current circulates in perpetuity, echoes of an orchestra of life. Panes of windows, ripe for smashing, are eyes staring out at what passes by. They flirt with chance encounters, the curious and bewitched. Look, don’t touch. Listen, don’t speak. We are neither happy nor haunted, alive only in our deadness. Reach back into the past, you strangers seeking heritage, and the ghosts of Olar dance again. This entry was posted in travel and tagged Olar South Carolina. When the economy tanks, give them bosoms! Growing up, I heard the story of the old guy (probably sitting in this general store!) back in 1940, who heard the reports of German advances into the Scandinavian countries – first Denmark, then Norway. Amazed, his comment was ” I don’t know ’bout them, but I do know them damn Nazis will sure catch hell in Olar!” . . . pronounced “OH-LAR” in this instance, usually pronounced “OH’-luh” by the more sophisticated. It perhaps helps to know that Denmark-Olar school district also includes Sweden, and Finland just north of Denmark – with Norway being on the “other” side of the Edisto River. Of course, Bamberg is the nearest large town. Love this story. I’ll try to look him, or his kin, up the next time we go to Olar. One of the loveliest, best written things I’ve read in some time. Seriously. we’ve been to Olar but we still like Denmark! !